All County Window Cleaning will do the job for you. We do not do it from the ground and we do not blow the debris all over your yard. 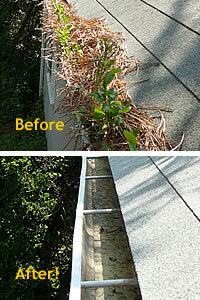 We go to the gutters, we remove the debris that is in your gutters. We then flush the gutters and the downspouts to assure that they flow smoothly. Gutter Cleaning is a necessary evil to prevent debris buildup which can cause serious and expensive damage to your gutters and your home. All County Window Cleaning can do a one time cleaning or you can get a bi annual contract where we will come to your home or business twice a year to clean out your gutters. This eliminates you having to call for an appointment and you don’t even have to be home. Are your gutters overflowing when it rains? Ugly black streaks on your gutters? How many times have you looked up at your gutter and fascia and wished those ugly black streaks would disappear? Now there is a way. Look no further. All County Window Cleaning can provide the elbow grease to make those ugly stains completely disappear. 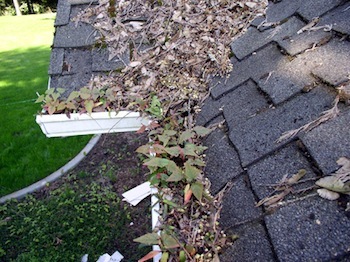 We guarantee your gutter will be restored to its original condition. They will look brand new, with our gutter whitening service.